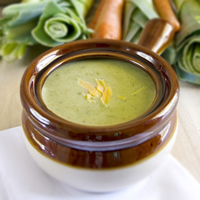 Nothing cuts the cold like a warm bowl of this creamy and delicious soup. In a large pot, heat olive oil over medium heat. Sauté shallots and onions until translucent. Add garlic and cook for 1 minute. Add broccoli, celery, spinach, and potatoes. Sprinkle with mustard and thyme. Continue to sauté for about 5 minutes. Pour chicken stock over vegetables and bring to a boil. Reduce heat, cover, and let simmer for 40 to 60 minutes. In batches, purée the soup in a blender. Return soup to pot and stir in shredded cheese. Slowly whisk in milk and return to a simmer for 5 minutes.